The Nintendo Switch seems like it could be the perfect portable gaming console—were it not for the bulky dock required to connect it to a TV. That’s why gamers have gotten excited about a pair of compact Switch HDMI adaptors currently being crowdfunded, but you might be better off spending your money elsewhere. When Nintendo finally released the Switch, users discovered that you couldn’t just plug it into any regular old USB-C to HDMI adaptor, like those sold by Apple, to connect it to a TV. Nintendo’s Switch dock included extra electronics that were required for it to work. And while smaller third-party accessories, like the Portable Docking Kit from Nyko, have managed to make the Switch dock less bulky, they still aren’t quite pocket friendly. Over the past few weeks, however, a Kickstarter crowdfunding campaign for a compact USB-C to HDMI adaptor called the Switch-Con appeared online, as did a similar Indiegogo campaign for an equally small adaptor called the SFANS. Available with pre-order contributions of $69/£53.40 and $59/£45.65, respectively, both dongles promise to connect USB peripherals to your Switch, as well as its power adaptor, all while it’s connected to a TV over HDMI. Some gamers have pointed out, however, that both devices look awfully similar to an existing product called the C-FORCE CF001 adaptor that’s been available in China for a few months for around £25. The CF001 allows the Samsung Galaxy S8 to be tethered to a monitor and used as a makeshift desktop computer, in lieu of Samsung’s expensive DeX Station dock accessory. And it turns out it can also be used to successfully connect a Nintendo Switch to an HDTV, as gamers on the GBATEMP forum have confirmed. 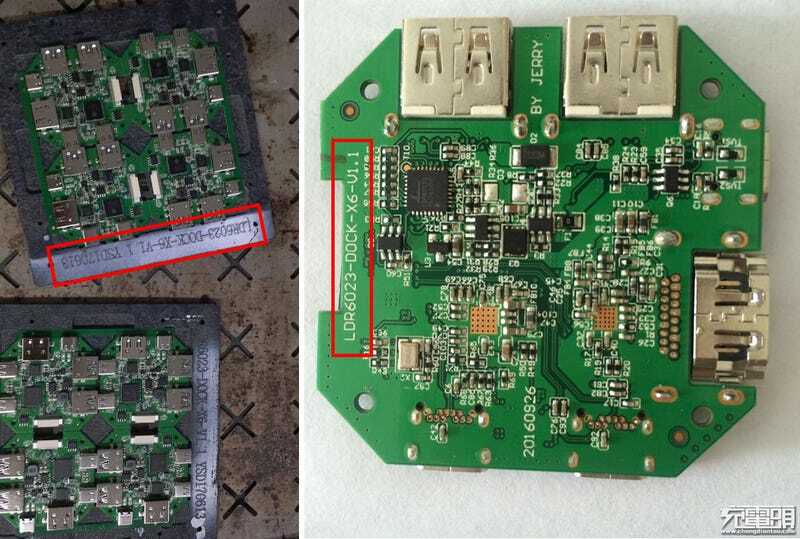 Not only do these adaptors look similar in design on the outside, in a ‘Manufacturing Update’ posted to their Kickstarter page on July 5, the creators of the Switch-Con revealed photos of the circuit board inside their dock, clearly labelled LDR6023-DOCK-X6-V1. That happens to be the exact same label as found on the board inside the C-FORCE CF001, which was torn down and reviewed on this Chinese site.